Koffing in game: 4,747 Who? Important notice! Pokemon Koffing is a fictional character of humans. Koffing (Japanese: ドガース Dogars) is a Poison-type Pokémon introduced in Generation I. It evolves into Weezing starting at level 35. Koffing is a spherical Pokémon filled with toxic gasses. It has vacant eyes and a wide mouth that usually has two pointed teeth in the upper jaw. However, a full set of teeth has been seen in the anime. Below its face is a cream-colored skull-and-crossbones marking. Several crater-like protrusions, which usually release a yellowish gas, cover this Pokémon’s body. Its purple skin is very thin, and over inflation can cause it to explode. Koffing composes gases within its body by mixing toxins with garbage, and produces more gas in higher temperatures. These gases are malodorous and cause sniffles, coughs, and teary eyes to those around it. The gases are also lighter than air, allowing Koffing to hover. When agitated, it composes a more toxic gas and expels it through the holes in its body. As shown in the anime, Koffing's gas can be ignited by fire or electricity. Koffing is most often found in urban areas. Koffing first appeared in Pokémon Emergency! as James's Pokémon. It evolved into Weezing during Dig Those Diglett!. A poacher had captured a bunch of Koffing in A Poached Ego!. A Koffing appeared in PK15. In Tag! We're It...!, Dawn and Conway battled against a Trainer who used a Koffing, alongside his partner who used a Scyther. The Koffing had several powerful attacks like Sludge Bomb, Thunderbolt, and Gyro Ball, but Conway's Slowking and Dawn's Piplup were able to defeat it. A Koffing appeared in Rocking the Virbank Gym! Part 1 under the ownership of Roxie. A Koffing under the ownership of a Coordinator appeared in New Plot, Odd Lot!, competing in the Mulberry Contest. A Koffing was seen in the Pokémon Dress-Up Contest in All Dressed Up With Somewhere To Go!. A Koffing made a brief cameo appearance in Destiny Deoxys and Giratina and the Sky Warrior. BW083 Koffing Ash's Pokédex Koffing, the Poison Gas Pokémon. 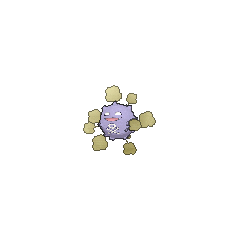 Koffing hovers in the air, thanks to the poisonous gases it contains, which have a foul odor and can explode. A Koffing appeared in File 2: Cubone under the ownership of a Team Rocket Grunt. It fought against Red's Jolteon and lost. A Koffing was shown under the ownership of a Team Rocket Grunt that invaded the Goldenrod Radio Tower in The Legacy. Koffing is seen as one of Koga's Pokémon alongside his evolution, which he first appeared in Striking Golduck. When Koga and Blue are ambushed by Agatha's Gengar in Gimme Shellder, Koga uses Koffing's smoke to relay his tactical plan to Blue without Gengar noticing. In Dealing With A Koffing Fit, Petrel, one of the Rocket Executives, attacked Silver and Eusine using the horrible odor induced by his many Koffing. 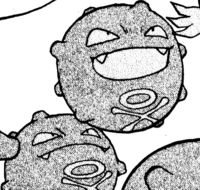 In PAORAS08, a Team Magma Grunt used a Koffing to battle at Sea Mauville. Koga uses a Koffing in Save The Chansey! in order to stop Red from getting to the Chansey. Green's Koffing appeared in The Pokémon Banana League (Part 2). Giovanni's Koffing appeared in Squirtle, the Crybaby Pokémon. When released from a Poké Ball, Koffing will initiate a Poison Gas attack which will pummel an opponent. Koffing did not return in Super Smash Bros. Melee and was replaced by its evolution, Weezing. Koffing appears in the 3DS version as an enemy in Smash Run. Its Poison Gas will reduce player's stats. It later reappears in Smash Tour, an exclusive mode for Wii U version. In this mode, Koffing will release Smokescreen, which will obscure player's view as well as a board for one turn. 3DS: This Poison-type Pokémon's balloon-like body is filled with toxic gases. In Smash Run, it floats over to fighters and expels gas at regular intervals. If the gas touches you, the stats you've worked so hard to build up will drop! Attack while it's deflated to take it down safely, and then help yourself to the many, many items it leaves behind. Wii U: A Poison-type Pokémon that looks somewhat like a blown-up balloon. As you might be able to guess, though, it's not filled with fresh air - that's poison gas, and this Pokémon isn't shy about sharing. In Smash Tour, the gas it spews will hide spaces and any items that may be on them. The smoke should disappear by the end of the turn. Pokémon Mystery Dungeon: Explorers of Time and Explorers of Darkness: Koffing is a member of Team Skull, along with Zubat and the leader Skuntank. This same Koffing is also the boss of Beach Cave. A Pokémon that is like a thin-skinned balloon filled with a highly toxic gas. Known to occasionally explode. If Koffing becomes agitated, it raises the toxicity of its internal gases and then jets them out from all over its body. This Pokémon may also overinflate its round body, then explode. Moves marked with a superscript game abbreviation can only be bred onto Koffing in that game. 51%-100% HP Ooh, I'm feeling a little bloated with gas. Can I release some? Level up Yes! I'm leveling up! Do I stink any worse? Koffing sprays poison mist to attack. It puffs up if a loop is drawn around it. It attacks by scattering Poison Gas. For other sprites and images, please see Koffing images on the Bulbagarden Archives. In the Pokémon Red and Blue beta, Koffing was originally known as "Ny", representing New York City's polluted air. Koffing and Weezing are the only pure Poison-type Pokémon immune to Ground-type attacks, due to their Ability, Levitate. According to a question of a Pokémon Exam the characters of the anime participated in, Koffing was supposedly first discovered in a public bathhouse. However, the Team Rocket expansion's Koffing card states that Koffing was first discovered in a weapons factory. This may be either because Jessie answered the question incorrectly, or due to an inconsistency between the TCG and anime. Koffing and Munna are the only Pokémon whose names are mentioned in music found in the games. Munna's name is heard in ミュージカル「メロメロ★ムンナ」 Musical "Charming Munna", while Koffing's Japanese name is heard in タチワキジム(演奏・DOGARS) Virbank Gym (Performance - KOFFING), although it is replaced with the word "Pokémon" in international releases. This distinction is possibly shared with Wingull, as its Japanese name, キャモメ Camome, is arguably heard in the obscure vocals of ビレッジブリッジ Village Bridge. Koffing shares similar traits to Grimer and Trubbish. All three Pokémon are pure Poison-types with a single evolution and roughly the same base stat totals. Considering its looks, its ability to float, and its tendency to explode, it may have been based upon a floating naval mine or living meteorite. It is also based on smog and other forms of air pollution. Koffing may also be based on the imagined fear that heavy pollution, caused by the leakage and/or improper disposal of toxic and/or radioactive waste, may result in the breed of new and undesirable life forms. The crossbone skull under its face is a reference to the toxic hazard symbol. 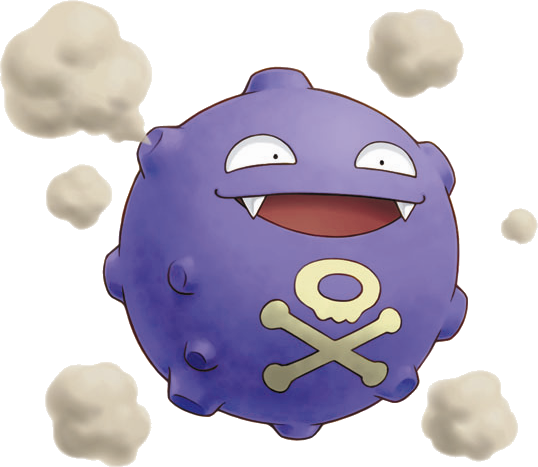 Koffing is a corruption of coughing. Dogars is a combination of 獰 dō (bad) or 毒 doku (poisonous) and gas. Cantonese Chinese 毒氣丸 Duhkheiyún Literally "Toxic gas ball"
Mandarin Chinese 瓦斯彈 / 瓦斯弹 Wǎsīdàn Literally "Gas bomb"